Mothers Against Dairy is pleased to endorse Seed the Commons’s campaign to #GetMilkOut of public school meal programs. 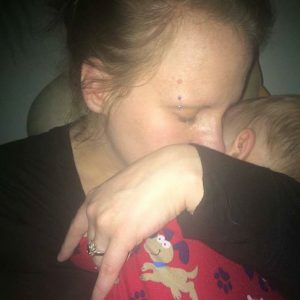 Cow’s milk is the number one food allergen in infants and young children, and disproportionately harms children of color. Read on to learn more in this article reprinted from the campaign website, and learn how you can get involved! For the very first time, World School Milk Day will be met with a different type of celebration. World School Milk Day was launched in 2000 by the United Nations Food and Agriculture Organization (FAO) to “raise awareness of school milk programs” and to encourage schools and other institutions to do more to promote dairy. Young girl prays before eating a school meal with milk during the Great Depression. Around the world, milk consumption is rising drastically (1) and school milk programs are one of the principle drivers of this increase (2). To create new markets, the dairy industry targets populations with no culture of milk consumption (3), and it does this with the generous and enthusiastic support of governments and international institutions, such as the FAO. From a marketing standpoint, children are the perfect recipients of free milk because their tastes and food culture are still being formed. By giving free milk to school children, school milk programs create generations of future consumers for the dairy industry. Through sustained promotional efforts around school milk, and misinformation campaigns funded by the dairy industry, children and parents everywhere are given the message that milk is necessary to grow tall and healthy. They are told that only milk can provide sufficient calcium for healthy bones. By extension, they are led to believe that other foods are inherently lacking, despite the fact that other sources of calcium, protein and other vital nutrients are incredibly abundant in whole plant foods and in the diverse food cultures of this world. Corporate consolidation has led to a loss of biodiversity and to the homogenization of food systems, and the aggressive global promotion of dairy further erases and devalues other sources of nourishment. School milk programs play a big role in this process. They are an incomparable boon to the dairy industry, which is why they are implemented everywhere. Representatives of the dairy industry, development agencies, and government agencies convene regularly at School Milk Conferences to share best practices and plan for the growth of school milk programs around the world, and especially in countries of the Global South where milk is not a traditional food. 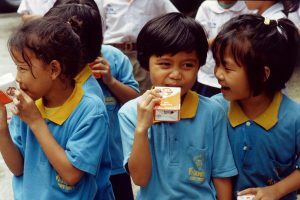 School milk program in Indonesia funded by Swiss-Swedish multinational Tetra Pak. Every year, schools worldwide put on celebrations for World School Milk Day that encourage children to think of milk as fun, healthy, and above all, necessary. 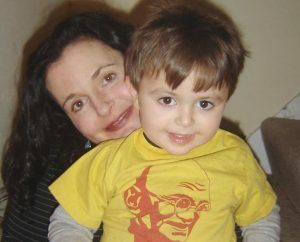 Children are not told that dairy consumption increases the risk of myriad health issues, from obesity to cancer, and that it is not linked to a decreased risk of osteoporosis. 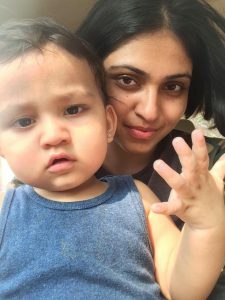 Children are not told that greens, seeds, nuts and tofu are all excellent sources of calcium, and that, unlike milk, they also contain fiber and other health-boosting plant nutrients. Children are not taught that in all species of mammals, mother’s milk is specifically tailored to the needs of their babies, and that cow’s milk is as unnecessary for human nutrition as cat’s milk or elephant’s milk. Children are not told that lactose intolerance is the norm, not the exception, and that lactose intolerant people do not have to tolerate or work around unpleasant symptoms to be healthy. So this celebration will be different. In response to World School Milk Day, we will celebrate the abundance of wholesome foods that exists in nature and in various food cultures. No single food is mandatory, and nobody needs to consume a food that makes them sick to get the calcium they need. Ours will be a true celebration of health and abundance. Our Counter-Celebration to World School Milk Day will take place on Saturday, September 30, three days after World School Milk Day. It will be a fun, full-day event with speakers covering topics such as school milk around the world, how to raise healthy children with plant-based foods, and more. We’ll have games, prizes, and of course… food! 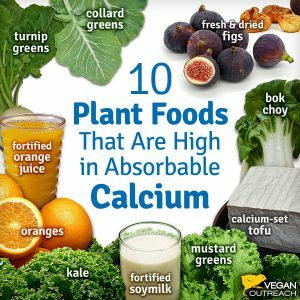 Plant-based foods are abundant in calcium; where do you think the cows get it? We’ll share tasty dishes prepared with calcium-rich foods such as broccoli, kale, chia and tahini. We’ll also have fun with dairy alternatives, so that people can learn about all the ways they can enjoy familiar foods without the milk. Join us and sample some of the most popular vegan cheese alternatives on the market! As school milk programs rapidly spread across the world, this Counter-Celebration will launch Seed the Commons’ campaign to reverse the trend. To support or receive updates on our efforts to get milk out of San Francisco public school meals, sign up here. For tips on hosting your own World School Milk Day Counter-Celebration, read on. Participate in our campaign to #ReverseTheTrend of milk in schools meals and organize a World School Milk Day Counter-Celebration in your city or school district. This is a great opportunity to bring together parents, children and everybody who eats for a fun and educational day to learn about the benefits of removing milk from school meals. Remember to share photos of your events with the hashtags #GetMilkOut, #ReverseTheTrend and #MilkFreeSchoolMeals! Here are some suggested activities:. Host games and activities for children and adults! From drawing your favorite vegetables to a dairy-themed jeopardy, the possibilities are endless. Organize a field trip to a school garden, community garden or organic farm to learn about the nutritional abundance present in plant foods that are local to your area. How the dairy industry uses milk in schools to grow their profits to the detriment of children’s health. How dairy industry lobbyists influence what kids eat at schools by helping set the nutritional guidelines. How milk in schools disproportionately harms children of color. How to raise strong, healthy kids with plant foods from around the world. Provide free samples of plant-based milk, cheese and yogurt alternatives. Learn more about milk in school meals.